When Matthew and I changed the format of our School to be independent study as well as more financially accessible, our hope was that folks would take full advantage of all the numerous materials to support them and their publishing endeavors. Publishing a children’s book, whether through traditional means or self-publishing, can be huge. Not just the physical creation but also powerful for the body, heart and mind too. It’s why I teach the way I do and why I focus on a holistic framework. We weren’t quite sure whether our hopes and changes for the School were manifesting. Many times we don’t hear how the work affects people until years later. So we couldn’t have been more pleased when after a school check-in email we were contacted by Sandra expressing how much she was getting out of the school. Sandra was using the materials in exactly the way we had hoped, self-publishing a book and starting her own press! She was taking action and she was bringing her whole family along for the ride. 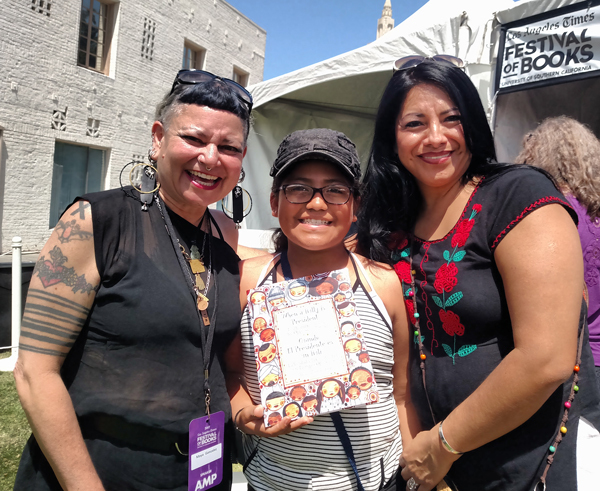 We were lucky enough to connect in person when I was at the LA Times book festival and I of course had to ask if we could do a short interview to hear more about her, her book and press, and how the School has supported her on her journey. It’s with my great pleasure that I present the first interview in my Self-Publishing Journeys series. I hope this will be the first of many student spotlights! Maya: Welcome, welcome, so first off I always like people to introduce themselves. Sandra: Hello. I’m Sandra. I’m an author of bilingual children’s books. I write books to share with families, English and Spanish words that tickle the tongue, words that enchant the mind, and words that tease the ear. I proudly parent two kind-hearted and creative human beings. I am the daughter of brave Mexican parents who brought me to California when I was 3 years old. I was raised with the deepest love, respect, and encouragement that a child could have. I am a Danzante – Aztec Dancer. 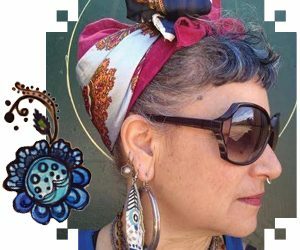 I connect with Tonantzin, Mother Earth, through this “kinesthetic prayer” that has been practiced for centuries. I am a community activist for social, economic, and racial justice because the balance on our wonderful planet that promotes love and happiness is off. I am a professional in the early childhood education field. I am passionate about family literacy and early learning where young children of color expand their vocabulary with sophisticated words because this enriches their life. Maya: Exactly the kind of person we had hoped would use the school and materials! So, what led you to join School of the Free Mind and what courses are you focused on? Sandra: I learned about you in 2013 when I was researching bilingual children’s books written by Latino authors to develop literacy tools for families during my graduate studies. I created a Family Conversation Guide based on your book, “My Colors, My World/Mis colores, mi mundo” because the robust vocabulary words in your book aligned perfectly with the goal of my school project. The way the action steps were set up seemed doable for me and I could not have been more convinced that I’d finally make progress on my goal to self-publish. Late in 2016, as I sought resources for publishing my book, I went to your author website. It was then when I first learned about School of the Free Mind and I signed up for your mailing list. I was enthralled to read the details of all the courses you offered. In January 2017, I signed up for the School and specifically for your Make Books NOW! course. The ten-step action program caught my attention immediately because it had been about two years since I was “working on” publishing my book, but wasn’t getting past Step 1! The way the action steps were set up seemed doable for me and I could not have been more convinced that I’d finally make progress on my goal to self-publish. In addition to focusing on the Make Books NOW! course, I have also spent quite I bit of time on The Heart of It course. My favorite part of this course is how incredibly inspiring it is for authors to create children’s book that truly do have the potential to change the world. And it does so with such lovely language! Maya: I have to say this definitely makes me smile. So from your perspective as a person of color, what did you find at School of the Free Mind that you didn’t find elsewhere? I found recognition and validation. Sandra: I get a warm sensation in my chest and my eyes are watery as I answer this question…I found recognition and validation. Recognition that my voice, my intentions, and my ideas are meaningful, powerful, and beautiful. Validation that my work, my book, and my message need to be shared with community because lives can be transformed through strengthened bonds between parent and child. Other “schools” I’ve learned from provided important content and resources to publish a book – basically how. With School of the Free Mind, I found that the information and resources, while they are exceptional, were almost secondary. In my perspective, I found that your School is very intentional with sharing the why I should publish my books. As I perused your School’s website, my motivation to set specific action steps and deadlines grew because it almost felt like I was doing a disservice to my community by not taking steps! The more I read the goals and objectives of the courses you offered, the more enthusiastic I became to be part of the movement to bring more books authored by POC – and I understood why this is so crucial. Other sources gave my brain information I needed to publish a book, but your School gave me what was missing. It gifted my heart and my soul the purpose, the inspiration and the affirmation I needed, precisely, to bring my book to life. Maya: So my “evil plan” is working, lol! 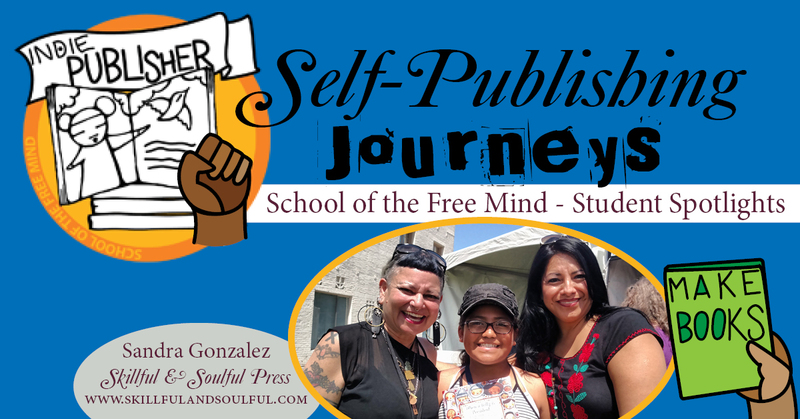 I know you’re working on publishing a book this year and starting your own press! How have the courses supported you in this? Sandra: For the first time in my very-long-children’s-book-publishing-journey, I set a date for the release of my book! The reason my book will be published November 2017 is because I am following the 10-month timeline that was set by Make Books NOW! We are on track to self-publish our book because of the support from the course. For example, the manuscript was pretty close to complete when I enrolled in January, but I didn’t have a clear understanding of the editing process, book layout, or illustration details. I do now. I knew that my book would be published somehow, someday, but it never crossed my mind that my press would be the one publishing our book! Forty-hour work weeks and Danza take up much of my time, leaving very limited hours to work on the publishing process – never mind having time left to actually research the information you need to establish a press. The manuscript was pretty close to complete when I enrolled in January, but I didn’t have a clear understanding of the editing process, book layout, or illustration details. What I appreciated the most is the very detailed outline with sequential steps needed to advance on my publishing journey. All the tasks are listed clearly, all the links you’ll need (and then some!) are provided, vast resources are laid out in the simplest form. The videos keep me engaged, the infographics within the course are amazing, and when I have questions, Matthew is more than generous with his time answering my inquiries. Many nights, I’ve said to my family, “Oh my God! I could not have figured this out myself. Matthew and Maya saved me so much time!” It’s true. Maya: That’s so sweet Sandra. We’ve always felt compelled to share anything we learn with our community. We felt like if we could do it, then others could too. Speaking of which, since the school has an independent study format and publishing a book is a big endeavor, I’m curious if you have advice about how you stay focused and motivated on your path? Sandra: A HUGE endeavor indeed! Since I work full-time outside of my home, balancing my time and maintaining a strong focus has been a tremendous challenge. However, I did implement a few strategies that helped. This year, colleagues at my office started somewhat of a “self-care club”. During the week, we practiced five minutes of meditation and three minutes of visualization each afternoon. My visualization was dedicated to seeing my book published and out in the world! I even planned my book-launch party during those three minutes! Definitely, being accountable to my word is keeping me motivated. Another strategy was to share my release date with as many people as I could. Definitely, being accountable to my word is keeping me motivated. It also helped that my colleagues asked me to do a read aloud of my manuscript and give a small presentation on my self-publishing journey. My smile shines with encouragement when I have people asking if I am taking pre-orders of my book! Also, I made a promise that I would not skip my lunch break and I use those hours during the week to view the course webinars and read the material. Finally, I scheduled every Sunday as an “author work day” on my calendar. It doesn’t always unfold as such , but I still appreciate the notification on my cell every Sunday at 9:00 a.m. because it reminds me that I’m on a mission! Maya: Fabulous suggestions! I’ve always been very disciplined myself but I know it can be tricky in the mix of life so hearing strategies from others is always helpful. You’ve shared with me that your kids have been involved in the process in different ways too, can you tell us more about that and why you think it’s important to have them be a part of it? Sandra: The first book that we are publishing is co-authored by my 10-year old daughter, Julia Rae. The story is inspired by her and a heart-warming conversation we had when she was about 4 years old. The entire writing process was completed with her input and approval. All our books will be bilingual and they will feature a robust vocabulary because I know, firsthand, that this is a need in communities of color. Each book will have a glossary with child-friendly definitions, created by Julia Rae, that parents can use as a tool to teach their children the words found in the book. My children have always been word lovers and word teachers. My son, Cristian Gabriel, who is now 15 is phenomenal at helping us explain the meaning of fancy words to preschoolers in a very child-friendly way. He is also our IT guy. It’s important that they hear the truth. It’s important that they know their role in helping this world become one where many other worlds fit. Since they were very little, both Julia and Cristian listed “publish a chapter book” on their bucket list. I know that they will one day check that item off the list. I am ecstatic to know that their books will be added to the total books published by Chican@ authors. I’ve learned from you how important this is. My children heard you speak on the panel at the Festival of Books in Los Angeles this spring. They heard the facts and the sad statistics on the number of books that POC need to publish in order for us to be equal to the number of books being published by White Americans. It’s important that they hear the truth. It’s important that they know their role in helping this world become one where many other worlds fit. In our family, we do that through community activism, through education, and through sharing with others what we know. Maya: The statistics are sobering which is what makes me so happy to see you and your family taking such amazing action. So, tell us more about your book and press and how people can find out more and stay in touch. Vision: A world where parents and their children are creators of social change and community well-being. Mission: To inspire families to live courageously, learn endlessly, and love passionately so our world is better. The books we publish will promote the Skillful & Soulful Movement. This movement is about living a balanced life. Skillful refers to living in a logical and analytical way – fully in our masculine energy . Soulful refers to living in tune with our intuition and creativity – fully in our feminine energy. We believe that our best, most blissful, experiences as human beings will be lived when we master the art of living in a way that is both skillful and soulful. The name of our press is Skillful & Soulful Press. Our first book, “Mommy, Tell Me Why I Am Radiant” is a bilingual picture book. Our first book, “Mommy, Tell Me Why I Am Radiant” is a bilingual picture book. The book highlights a delightful mother-daughter conversation reminding moms that children will often grow up to be just like them. When moms live a joyful and radiant life, their children learn to live equally as joyful and radiant. The positive words help increase little girls’ self-confidence and self-worth (and perhaps moms’ too!). The robust vocabulary helps close the “word gap” which is the difference in the number of words children from families of different socioeconomic backgrounds hear. Reading experts say that young children who hear new and interesting words are better prepared to succeed when they enter school. This also promotes a love of language that helps children become stronger readers. Finally, the awe-inspiring similes in “Mommy, Tell Me Why I Am Radiant” inspire a family’s deeper appreciation of nature and our Mother Earth. Reynaldo Mora is the artist illustrating the book. He, too, is a community activist and Danzante who shares the same political values and societal beliefs as my children and I, so the energy that he brings to this book series is simply extraordinary. We can’t wait to see the final art! The book will be sold through Amazon and indie book stores in late November. Our website will be www.skillfulandsoulful.com and should be live in September or October. Maya: Sounds amazing and powerFULL. I can’t wait to see the final book in print and I anticipate many more to come! Is there anything else you’d like to share about you or the journey so far? Sandra: I want to share words of gratitude with you, Matthew, and Sky too! Thank you. Thank you. Thank you, for your super powers! The work that you have done and continue to do is magical. Please know that your effort is changing lives and the values guiding your School of the Free Mind are transforming the world to be more wonderful. Maya: Thank YOU for sharing and for giving us a window in to your process, Sandra. I look forward to checking back in again once your book releases and your website is live! Definitely keep an eye out for more from Sandra and Skillful & Soulful Press. And get her debut book “Mommy, Tell Me Why I Am Radiant” when it hit shelves in November! 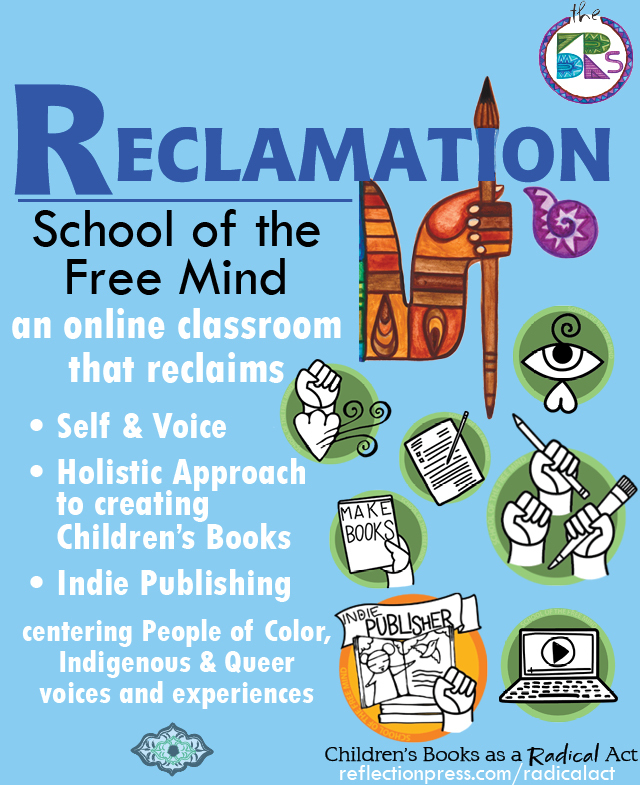 For more about School of the Free Mind, take a look at our school website, view sample course materials and join the classroom. We’ve reduced the registration fee for these last 5 months of 2017. A great time to get started on your book and get the creative juices flowing!